It’s always nice to see natural beauty brands grow and evolve! Remember the British brand Essential Care? It is now Odylique by Essential Care – same organic, cruelty-free brand with the same excellent certified organic products, but with a new “face”. “Odylique” means a “power of nature”, so the new name makes sense and suits the brand perfectly. I’ve tried more than a few of its skincare products in the past (Rose Moisturiser, Avocado Day Cream, Coconut Cleanser, and other) and many of them were great, so I’m very excited to review this lovely duo! This is an award winner right here! In 2009 the Superfruit Concentrate won The Green Beauty Bible Award as the best facial serum and the silver medal for the best skincare product in the UK Beauty Awards. Superfruit Concentrate is made with certified organic avocado oil (highly hydrating), pomegranate extract (protecting and repairing), and my ultimate favorite rosehip extract (skin restoring). The serum has a gentle, pleasant scent, but I have no idea how I could describe it. It looks very orange, the color I believe is obtained from seabuckthorn oil. However, it doesn’t stain the skin so don’t worry, it won’t be making you look like a carrot. It’s quite thick; therefore you only need 1-2 drops for the entire face and neck (it has a pipette, so it’s easy to measure). It’s important to use it sparingly, because of not only that way the serum will last you longer, but also it won’t feel greasy and get absorbed into the skin quicker. I’ve been using it for almost two weeks and can say that I like the results a lot. The serum gives a delicate glow and intense hydration for my dry skin patches. Its price is not over the top; however, it’s not the lowest one either – $40/£33. In my Top 5 Things That Blogging Has Taught Me post, I explained why I think that skincare products are always a good investment. And while I hear many different opinions about whether serums are really worth their price or not, I can tell that my dry skin starts to sing with satisfaction after I apply this Superfruit Concentrate. Persea Gratissima Fruit Oil*, Simmondsia Chinensis Seed Oil*, Rosa Canina Fruit Extract*, Punica Granatum Seed Extract*, Hippophae Rhamnoides Fruit Extract*, Rosmarinus Officinalis Leaf Extract*. *Certified organic. Certified by Soil Association. Vegan. 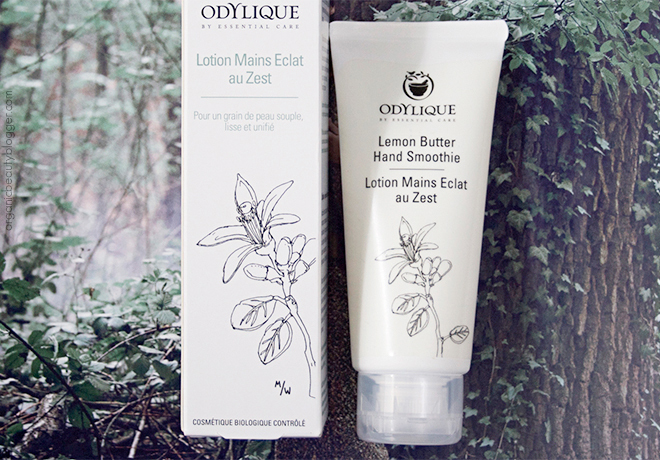 This hand cream (or a hand smoothie, if you prefer this sweet name better) is one of the newest additions to the Odylique range after its redesign. Since then, the Hand Smoothie has received so much attention and love from almost everyone who had the chance to try it. 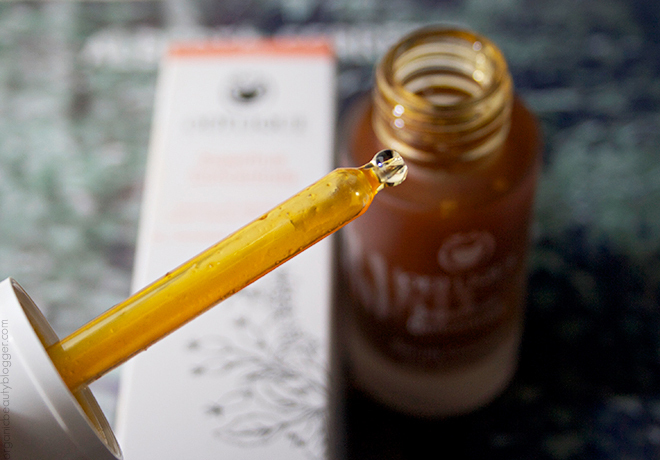 The lovely green beauty blogger Annie from Hello Purple Clouds is one of those who instantly fell in love with this product, and I absolutely see why. Aside from its delicious fresh citrus scent (it’s weird, but citrus scents somehow manage to boost my mood), the Smoothie also moisturizes and leaves my hands soft and silky. An excellent treat for cold winter months. Aqua, Cocos nucifera oil*, Theobroma Cacao Seed Butter*, Persea Gratissima Oil*, Helianthus Annuus Seed Oil*, Glycerine**, Cetearyl Alcohol, Hippophae Rhamnoides Fruit Extract*, Aloe Barbadensis Leaf Juice Powder*, Rosmarinus Officinalis Leaf Extract*, Cetearyl Glucoside, Citrus Limon Peel Oil*, Cymbopogon Citratus Oil*, Pelargonium Graveolens Oil*, Vanilla Planifolia Bean Extract*, Lactic Acid, Sodium Anisate, Sodium Lauroyl Lactylate, Sodium Levulinate, Xanthan Gum, Citral*, Geraniol*, Limonene* & Linalool* (in the essential oils). *Certified organic. Certified by Soil Association. Vegan. 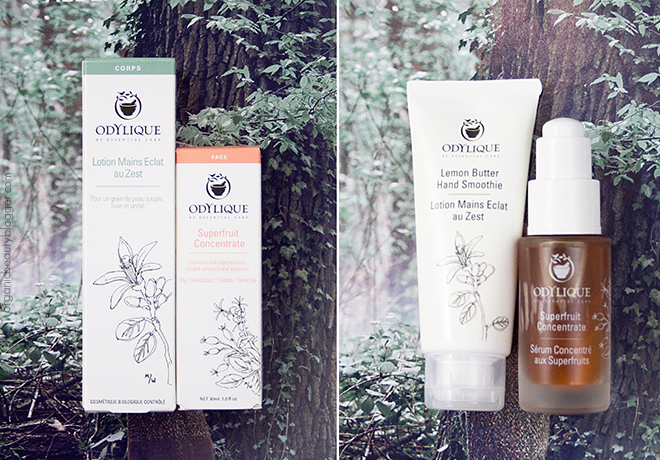 You can find Odylique organic beauty products online here, here, and here. Have you tried Odylique? Which product is your favorite? Sounds like a divine brand! That Superfruit Concentrate is especially attractive to me. I think that rebranding was good for them. Many of their products have always been great, but the packaging wasn’t too enticing like it is now. I haven’t tried much from Odylique but I do like everything I’ve tried. I love the sound of both of these and their new body product sounds lovely too!